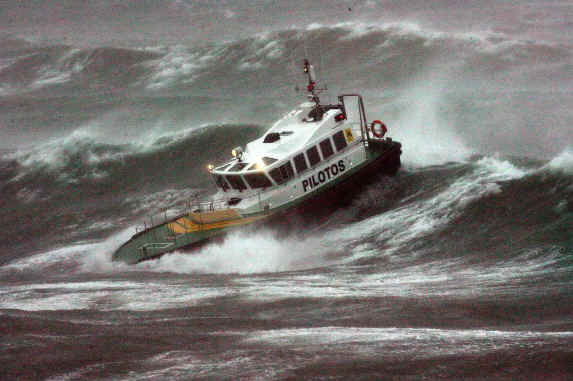 PILOT BOAT DESIGN AND MANUFACTURE, A BUILDERS PERSPECTIVE. Paper presented to the IMPA Pilots convention in London 2012. Paper written by Frank Kowalski, Managing Director of Safehaven Marine. Photo below, Safehaven Marines Interceptor 38 Pilot squaring up to a big sea. Aluminium vs steel vs GRP, the choice. Importance of wide walkways & clear foredecks. 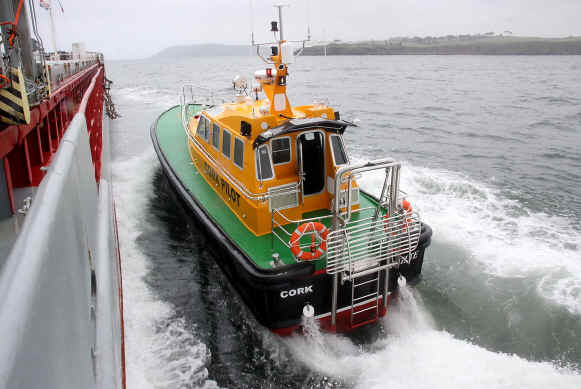 Safehaven Marine are specialist pilot boat manufacturers, we build around 6-7 pilot vessels per year and 80% of our production is specifically dedicated to pilot vessels. This means we have amassed a great deal of experience in this specialized area, and have supplied over 25 pilot vessels to ports worldwide and our Interceptor range of pilot vessels has renowned reputation for their sea keeping abilities. Since the 1970's, a period which saw the archetypical Nelson become the standard pilot boat design, with its traditional slim, round bilge hull, built predominantly in GRP, it dominated the market for a great many years, and provided sterling service throughout the world, with very little competition. One of the reasons for this was the highly specialized nature of the pilot boat market, and its comparatively low volume. This meant that few, if any builders, were prepared to invest in the expensive moulds necessary for GRP pilot boat production. In recent years, several leading companies, with new, modern designs have established themselves. And of course, in a completely un-biased way, I consider Safehaven Marine to be one of them. The majority of new modern designs have been based around the medium to deep V, semi or fully planning chine hull design, in various forms. This design has proved to offer advantages over the traditional round bilge hull form which, whilst being very good into a head sea, is very wet, which can compromise visibility, and it lacks the dynamic stability of modern 'V' hull designs, when running down wind in big following seas at speed. The round bilge hull also lacks the 'V' hulls greater stability beam on to the sea, as well as during boarding man oeuvres, during which the latter, with its wide beam and chines offer greater stability as well as dryness, both important considerations for the pilot during transfer. Comparing like for like at similar displacements, the planning 'V' hull has the potential to go faster in the higher speed ranges, although at typical 23-25kt pilot boat operational speeds, the easily driven round bilge, semi-displacement designs can be its equal. Modern hull designs also typically feature either a full length keel, or a deep skeg, both give the advantage of protecting the stern gear and allow the vessel to beach, as well as providing good directional stability at slow speeds in rough weather. If speeds over 30kts are required then invariably the keel is omitted, as it tends to work against the hull at high speeds. On modern 'V' hull planning designs the use of adjustable trim plates can be very beneficial and allow the helmsman to lower running trim for head sea work, and here in combination with sharp forward sections can be very effective in providing a soft ride that can be equal of a round bilge design. There is a trend to try to go for lightweight pilot vessel designs to improve speed and economy, and whilst endeavors in this respect are always valuable, the two factors of light weight and sea keeping abilities can be can sometimes be mutually exclusive. Having built as example, over 40 of our Interceptor 42's in various displacements ranging from 9 tons to 16 tons, and having helmed them all in heavy weather, I can confirm that there is a big difference in sea keeping abilities between the two displacements. The combination of a good displacement, combined with a very low centre of gravity is simply unbeatable in the rough, giving much less lively motions. The heavier displacement is also especially noticeable in head seas, allowing the vessel to push through the waves with less tendency to become airborne. Light weight designs are very suitable for working inside the harbour in sheltered waters, but simply can not offer the same comfort and security to pilots offshore in rough conditions. GRP construction on pilot boats has in the UK generally proven to be the preferred material in comparison to the alternatives i.e. Aluminum and steel, (although steel can effectively be ruled out if higher transit speeds are a requirement). Probably around 80%+ of all pilot vessels in the UK have been built in GRP, which says a great deal about its suitability. The advantage of GRP is that it gives a superior acetic finish, is maintenance free, and as it is a homoengenious structure, it is not going to suffer from weld fracture. There is also no risk of electrolysis. However Its big disadvantage is that it requires expensive moulds meaning a large investment and commitment from the builder. Any concerns over osmosis have long since disappeared with the advent of modern isophathalic gelcoats. The great advantage of aluminium is that it does not require moulds, however it does require more specialized personnel in both construction and repair. Its ascetic appearance is less pleasing, and it requires greater maintenance in painting. GRP can sometimes be considered 'lightweight' in its construction, probably as a result of the large percentage of recreational vessels built in GRP. However, professional GRP commercial vessels are in fact quite the opposite, being very heavily constructed. As example, our pilot vessel hull has its strength increased locally at high stress areas, in fact the hull bottom thickness of our vessels can exceed 30 millimeters, (compared to 6-8 millimeters on similar sized aluminium vessels). This allows the builder to make the vessel exceptionally strong where it counts. Secondly the excellent French ‘NIB’s or Ocean 3 systems, which features a 3-400 millimeter round foam cored with a rubber skin that is retained in a grove formed in the hulls side, and secured with multiple straps, most commonly used in the French market. Thirdly the Lightweight, foam cored rubberized skin type, which is bonded to the hull with silkaflex and fourthly, the Pop Sure system, as above but which is formed with a grove, into which sits a hard plastic tube, held in place with a tensioned wire running through it. We can offer, and have fitted most of the available fendering options on our pilot vessels over the years, and can briefly summarise the advantages and disadvantages of the various types as follows. Cost, it is by far the cheapest type. Durability. Being thick walled, generally 25-50mm it resists damage well. Being through bolted it is relatively easy to repair, and repair can be carried out quickly, as sections are generally available ex stock from the manufacturer. The lightweight, rubber skin, polyethylene foam type systems. 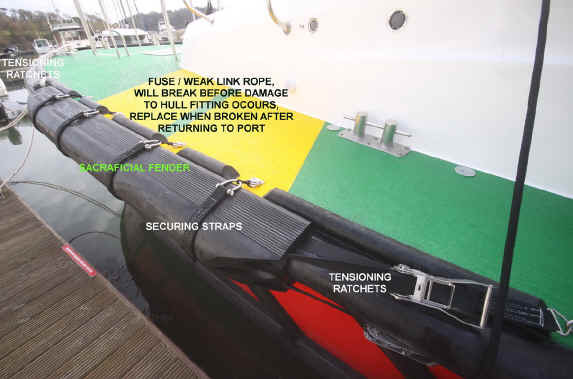 Being Lightweight, these systems reduce the vessels weight, potentially increasing the speed of the vessel, although this can be somewhat negated on the types retained with straps due to the numerous necessary deck & hull fittings. All offer better impact absorption, imparting less load on hull structure. 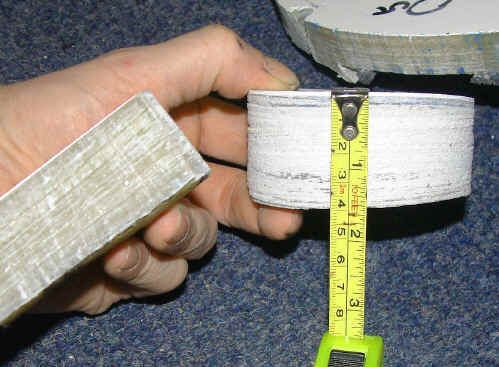 All systems are significantly more expensive, between six to ten times the price of rubber fender. All have to be custom made for the specific vessel, meaning if a section is damaged, repair will be slower, unless spare sections are stocked by the port. Durability, some systems are more durable than others, but with all the outer rubber skin is not as thick as rubber fendering, and as a result, can more easily ripped or punctured by sharp protrusions on the ship side. The Pop Sure system bypasses these disadvantages as it is the hard plastic tube that impacts with the ship. In making a decision, the significant cost differential of the alternative systems must be weighed up against their advantages and disadvantages, when deciding on which system is to be used by the port. It can be difficult to beat rubber ‘D’ section, it is the most commonly used fendering system, it is the cheapest, and it is easy to replace a damaged section quickly. 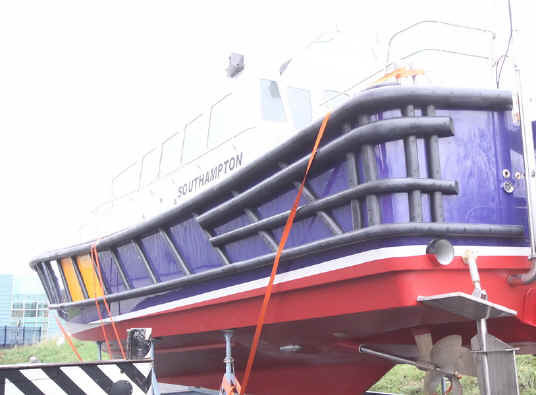 Specifically in respect of Safehaven Marine we have our own 'Sacrificial fender system' which we have uniquely developed and is used with rubber 'D' section fendering. It has been fitted to pretty much all our pilot vessels over the years, it is well proven in service and gives the best of both worlds. The sacrificial fender fits over the 'D' section like a glove, and is retained with straps. It provides soft impacts, protects the main fendering. It is cheap, durable and quickly replaced, (a 3m section costs only a few hundred euro), and the straps and fittings are of no significant cost. Below, Safehaven Marines special sacrificial fender. Predominantly, it is conventional stern gear that is the preferred propulsion system. The only other viable option is water jets. Water jets. Assuming that the operator is fully trained and experienced in the operation of water jets, it is amazing what the vessel can be made to do at slow speed maneuvers. However the caveat being that the operator must be experienced in the use of water jets, trying to introduce water jets to a port where the operators have been used to props would, I imagine, be fraught with difficulties, and met with much resistance. Another advantage of water jets is the low noise and vibration levels that are achieved ,as well as shallow water capabilities (although rarely an issue in modern ports) as well as safety in casualty recovery from the water. However against these advantages, consideration must be given to the fact that water jets have significant disadvantages. At the slower speeds pilot vessels generally operate (23-25kts), jets are less efficient, only coming to their own above 30kts. At mid range speeds of 17-20kts, they are less efficient than propellers. In rough weather, especially in following seas when say, trying to climb the back of a big wave, they can overload and bog down. You can in this situation find yourself slowing right down and falling off plane, then having to wait for the wave to pass before the boat can regain speed surfing on the face of the next wave, at which times the lack of directional stability that comes from not having a deep keel or rudders, which means constant work on the helm. In these conditions a prop boat will just chug on through the waves. With water jets, trying to keep a straight course at slow speeds in cross winds can also be a real challenge. Finally the initial purchase cost must be considered, like for like a water jet system costs around 7 times the price of a set of conventional stern gear. Also maintenance costs for water jets are much higher. Conventional sterngear. This is the most common system of propulsion on pilot vessels and is hard to beat for its all round effectiveness. Its main disadvantage over jets is the increased draft, susceptibility to damage from floating debris and increase noise levels however in so many respects it is superior offering virtually no maintenance, excellent directional stability and capabilities in rough conditions, its efficiency at transition speeds of 17-20kts is very good and factoring the price difference it is hard to beat and easy to understand why, for the vast majority of applications it is the obvious choice. The use of Pilot boarding ladders in their various forms is quite divergent. In some countries they are the norm, whilst elsewhere they are rarely used. In my experience they appear universally favored in France and we have built and incorporated such systems on all the French pilot vessels we have built. The French pilots I have spoken with swear by them. 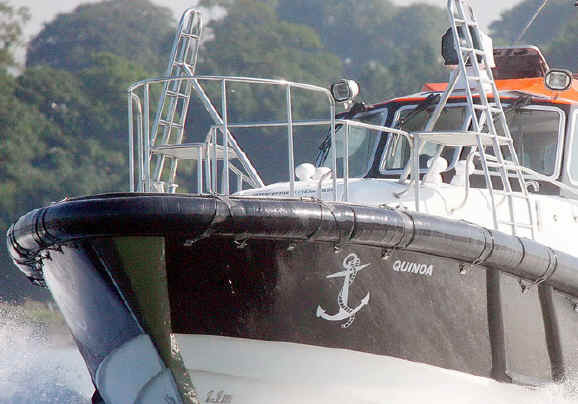 But in the UK however, very few pilot vessels have been fitted with them and pilots there do not tend to favor them. 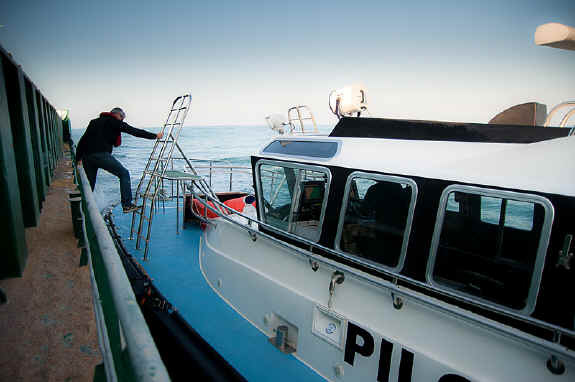 The advantage of the ladder is that it reduces the risk of the pilots foot becoming trapped between the pilot boats deck and the ships side, as it places the pilot clear of the impact area. The ladder, by its nature, also provides many more surfaces to grab and hold onto than just a single railing. The disadvantage is that the pilot is subjected to higher motions when on the ladder by being elevated 1m above the deck. These motions can be quiet high in rough weather. There is of course the risk that in a big roll, the pilot could be crushed between ladder and ship, however platforms at the back of the ladder allow the pilot to quickly to duck clear. Still, I imaging that this is the biggest concern. 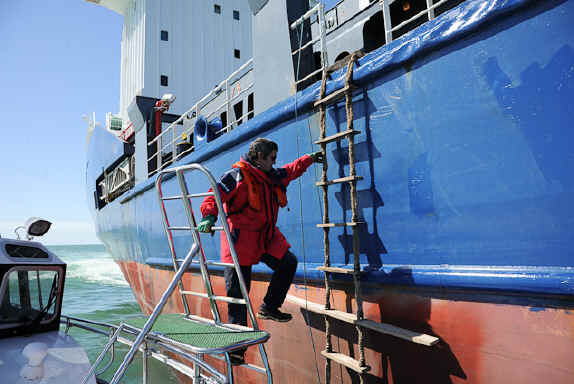 As a result the pilot ladder is more likely to be used in calm to moderate boarding conditions, and not so often used in rough conditions, however, ironically, it is most likely only in rough conditions that foot injury is likely to occur, the prevention of which is the ladders primary purpose. As well as adding top hamper, the ladders do restrict f/wd visibility, although not as badly as one might think, and I imagine the debate on whether to fit pilot ladders or not, will continue. Most important on a pilot boat is the consideration for safe and quick pilot recovery, should he accidentally fall or be swept overboard whilst boarding a ship. We have developed our own transom mounted fixed M.O.B. recovery platform, which has been used in anger in a real life incident, to recover a pilot. Feed back we have received over the years has allowed us to refine the system. We have also fitted the 'Jasons Cradle' recovery system as well. I can impart some opinions about both. 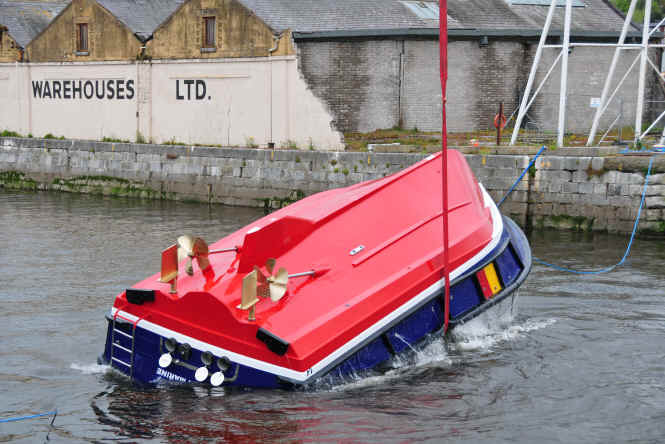 The advantage of a well designed, fixed transom recovery platform being that it is instantly deployable, it should extend at least 400mm below the waterline to ensure it stays submerged even in surge and roll, it should also have no sharp edges. As a further refinement our system can be integrated with a prop guard that drops down, and will help in preventing the casualties legs from coming near the boats propellers. Special attention needs to be paid to the lifting system used, be it manual winch or hydraulic. If manual, it should be born in mind that a large wet casualty will weigh a considerable amount, the winch needs to have a suitable ratio, or a double or triple pulley system to reduce the lifting force on the person operating the winch. One disadvantage of stern platforms is that invariably the vessel drifts beam on to the wind, therefore when allowing the vessel to drift down to the casualty, securing the casualty can be difficult. A Matesaver, or even a boat hook is essential for recovery. Another consideration is visibility for the helmsman if backing down towards the casualty, good rearward visibility is essential, rear view cameras can be incorporated to assist him. 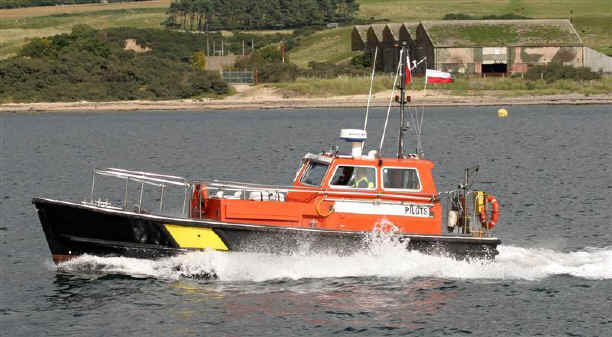 However the ideal solution, one which we have used regularly is that of a second aft helms station positioned on the rear of the cabin, this allows the helms man good visibility and control of the vessel during recovery. This brings us to the Jason's cradle system, the main advantage of which is that the casualty can be recovered from a midships position, clear of the props and the vessel can be better oriented for drift. From this position the helmsman invariably has clearer visibility of the casualty during recovery, which is an advantage. Bellow Safehaven's MOB pilot recovery platform during trials. The Jason's cradle should ideally be stored in a locker at the recovery position, allowing it to be quickly deployed, and when correctly operated it can be very effective. One disadvantage of the system however is the necessity for ropes and pulleys that need to be connected, which takes valuable time, and can invariably become entangled. This can present difficulties, especially considering the stress the operator could be under at night in rough conditions. 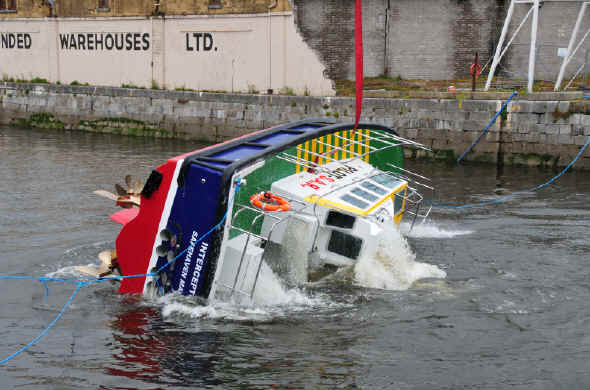 Whichever system is chosen training and practice drills should be regularly carried out to ensure all crew members are familiar with the recovery procedures. Below, Jasons cradle system. Nowadays, a central helm position is favored on most modern pilot vessels. This gives the advantage of equal visibility for the helmsman when coming alongside either to port or starboard. The helm position should be ergonomic in design and should feature 4x4 jeep or van like seat / wheel positioning, by this I refer to a near horizontally orientated wheel, which should be adjustable for angle. The foot rest should be large and wide allowing the helmsman to brace himself in rolling, not just be a step or rail that the helmsman feet can easily slip off in rough weather. Throttles should be within reach without stretching as should regularly used controls such as wipers, trim tabs and radio mic, allowing the helmsman to instinctively lay his hand on the controls, without searching them out. All navigation instruments should be easily visible, without being obscured by the wheel, a common oversight. It is best to minimize the switches close to the helmsman to only often used essential systems, i.e. nav lights, deck lights and such forth, and to avoid overly cluttering the immediate helm position to minimizing confusion. Suspension seats for crew and pilots are essential, and seat belts are a good idea, although whether they ever get used is another matter. We have found that air suspension seats, although more costly do offer the best ride. Assuming adequate space, a table in front of the seat can be beneficial, it can be a useful hand hold and better secures the pilot, as well as being useful during long transits to hold papers etc, and is a feature we regularly incorporate. Self-righting- a valuable feature for all weather pilots. All Safehaven Marines pilot boat designs are inherently self righting by virtue of the superstructures volume and buoyancy, it being impossible to keep the hull floating upside down. The stability curve should be positive, or at least close to positive right through 180 degrees, this is often difficult to achieve due to a pilot boats wide side decks, and there can be a soft spot around 100 degrees, however this is somewhat academic, as in a real life roll over situation, any force enough to roll her to this angle will roll her right over, or roll her back as the wave passes through. A roll over event as we have seen from our righting trials is quite a violent event, and pilots and crew would have to be wearing seat belts to avoid injury. Self righting is of course dependant on the vessel maintaining watertight integrity, and to achieve this numerous special design features need to be incorporated. But for Ports where pilots have to operate in dangerous sea areas in all weathers, such as across bars, or where tidal influence may create exceptional sea states, self righting is a valuable safety net for the pilots and crew.